Up to this point the project has gone without a hitch. Lately though certain setbacks in organization and preparedness have reared their ugly heads. As my lab partner and I chug along with the phytoplankton maintenance and our precious horseshoe crab, we notice that mollusks that have made a home on the back of our crab have begun to die and fall off. Not thinking much of it we continued our work. After a few days the crab had reduced activity and refused food. My lab partner attributed this to the nocturnal nature of horseshoe crabs and assured me it was fine. Unfortunately a few more days later, we found sweet Hillary dead. To this point we are still unsure of the cause of death, though I suspect that the filter my partner provided was unsatisfactory due to the age of the carbon inside and lacking in the healthy population of nitrobacter* that all filters need. This most likely led to a steady incline of ammonia levels that eventually became overwhelming and suffocated the poor crab. A day or two investigating the death yielded no conclusive answer. The only solution we saw fit was to rethink the whole system. We analyzed the current methods in place of aeration, heat, and filtration and came to the conclusion that the system simply is not sufficient. 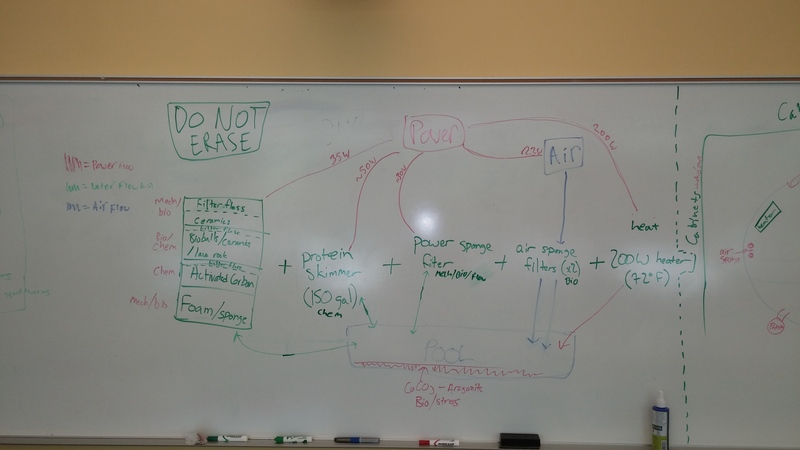 My partner and I brainstormed while he drew a rough diagram of a new system on a whiteboard. He added new equipment (a protein skimmer**, air sponges, a new heater), new filter media (layers of porous sponge, activated carbon, filter media, rocks and ceramics) and substrate for the pool. From there I was able to label and categorize the different types of inputs (power, air, water) the different processes (chemical, biological and mechanical) and power requirements for all of it. Once this system is in place, I am confident that the pool will support any more crabs we add to it. By the time of my next post I hope to have made progress with new cultures of algae. We are putting in place a timeline for experiments and tasks to analyze, purify and process the algae. This entry was posted in Science and tagged algae, aquariums, bacteria, horseshoe crab, marine biology, science on September 29, 2014 by lukebley2014.